With dozens killed in the southeast of our country, it puts into perspective our complaints about heavy fog, drenching rain and the largely cold and damp spring that we’ve had until of late. But, like hurricanes vs the tails of hurricanes, weather like we’ve been seeing is far more likely to affect us and thus we should understand the forces at play. This column is about that. We’ve all heard of the “lake effect” where the Great Lakes dump so much snow on upstate New York and nearby states. Snow accumulations of 10 to 12 feet over the course of the winter in Buffalo are not unusual. The phenomenon occurs when cold air flows over the relatively warm lakes. The relative heat of the lakes leads to warming of the lowest levels of the atmosphere, which promotes rising air. When air rises in the atmosphere, it is cooled, and if enough upward motion (and thus enough cooling) results, then the air will reach its dew point and condensation will occur leading to cloud development. Eventually the clouds will produce precipitation. And, if you’ve been following the weather in upstate New York (I was just up there for USCG business), flooding from unrelenting rain is rampant. Why doesn’t that happen here, at the seashore where all the same characteristics are at hand – warmer water, winds and cold air? In fact, it does. The ocean effect just doesn’t get as much media attention since nobody lives over the ocean, and there are no roads to get clogged by snow. Also, the temperature gradient isn’t as great since we don’t get as much of that Canadian cold air as they do upstate. Since most of us aren’t boating during the winter months, it isn’t much of an issue. However, with the extremes of weather we’ve been seeing, we can see the ocean effect both in the fall and the spring. And what doesn’t fall as snow falls as rain. And plenty of it, as we’ve seen. 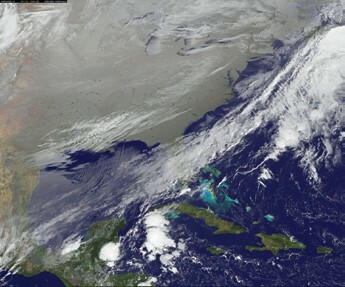 The above satellite photo shows an excellent example of ocean effect conditions. Clear skies over the mainland and plenty of cloud cover over the ocean – and seashore communities. The basics are very similar to the lake effect scenario; thus, it will occur when rather cold air flows over the warmer ocean waters. Once the air has been over the water long enough (i.e. a bit offshore), it warms and rises – and clouds will form. And, if the temperature difference between the air and the water is large enough, precipitation will develop from these clouds. This situation will frequently occur behind a cold front that has moved offshore. Typically, a cold front will be accompanied by showers, then clearing skies are likely after the front has passed and the colder and drier air mass moves in. Forecasts in coastal locations will indicate this progression of events, but offshore the situation may be different with clearing skies initially followed by the ocean effect conditions described above. And remember, all ye seaside residents, Montauk is 130 miles out at sea, relative to New York City. These long shorelines of the northeast can create “at sea” weather conditions, right here on land. Captain Andrew Tucci is the Captain of the Port and Sector Commander for US Coast Guard Sector Long Island Sound. Captain Tucci is responsible for all active-duty, reservist and auxiliary Coast Guard personnel within the Sector. As Chief of Staff of the US Coast Guard Auxiliary First District, Southern Region, Vin Pica works closely with Captain Tucci and his staff to promote boating safety in the waters between Connecticut, Long Island and 200 nautical miles offshore. Sector Long Island Sound Command Center can be reached 24 hours a day at 203-468-4401.